Impoverished rancher Dan Evans (Christian Bale) has done everything in his power to keep his land from being sold to the new railroad coming through town, but he’s deep in debt to a local businessman and out of options. 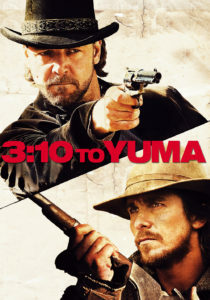 When he’s offered a job guarding charismatic bandit Ben Wade (Russell Crowe) until he can be put on the 3:10 train to Yuma Prison, he jumps at the chance, despite the bloodthirsty gang that has vowed to rescue their leader. This is a really good movie, and I’m not sure why. When you look at individual characters’ actions, they don’t always make sense, but it doesn’t even matter what the plot is. This movie is designed so that pretty much everything you want to happen in the movie actually happens, at exactly the right time, and it’s a perfect emotional rollercoaster. Christian Bale and Russell Crowe are amazing, Russell Crowe especially strikes the perfect balance of menace and thoughtfulness. The rest of the cast was terrific too – Alan Tudyk as the adorable town doctor, Logan Lerman as the rebellious oldest Evans son, Dallas Roberts as the company man who is made of stronger stuff than you’d think, Ben Foster (foreshadowing his Hell or High Water role) as the zealous bandit leader… pretty much everyone. This movie is like The Shawshank Redemption (although nothing is as good as that movie) in that it’s a simple story, but satisfyingly told. Highly recommended. Moana longs for nothing else other than sailing on the open ocean but she has responsibilities as the daughter of the chief, and her people never leave the safe waters around their island. Despite her father’s disapproval, she gets her wish when the ocean picks her to restore the heart of Te Fiti, the goddess of life, and stop the darkness that has been spreading for a thousand years. Moana is a Disney musical, and so it’s got the formula down, but who cares if it’s predictable? It’s fun and heartwarming, the songs are great, and it turns out that the Rock (who plays the demigod Maui) has a really good singing voice. Troubled Vietnam vet and cop Martin Riggs (Mel Gibson) has just lost his wife to a car accident, and the police department is worried about his mental health. They pair him up with veteran cop Roger Murtaugh (Danny Glover), who is on the tail of a drug smuggling operation. In true buddy cop style, they don’t get along at first, but soon learn to appreciate each other’s different styles. I thought this would be just be a dumb action movie, but it’s got surprisingly interesting characters, they don’t seem larger than life like most action movie characters do. I was really looking forward to this movie – it’s set entirely on a spaceship (which looked gorgeous from the trailers), and it stars Chris Pratt and Jennifer Lawrence! Unfortunately it was a little bit of a let down, mainly because it couldn’t seem to decide what tone it wanted to take. Chris Pratt plays a passenger who accidentally gets woken up from cryostasis 90 years early on a journey to colonize a new world, and wakes up a fellow passenger (Jennifer Lawrence) to keep him company. The movie can’t decide whether Chris Pratt’s character is creepy or just a great guy who got lonely – it wants all the drama of a huge moral dilemma, but also wants us to root for a simple romance. Plus, it absolutely wasted the sci-fi elements, the design and concept of the spaceship and the colonies was great, I would have loved to learn more. Lion is based on the true story of Saroo Brierly, a young Indian boy who was separated from his family when he accidentally boarded a train that took him thousands of miles away. After he grows up (adopted by an Australian family), he manages to track his birth family using Google Earth and scattered memories. It’s a pretty amazing story, and the first half of the movie (featuring young Saroo’s story) is incredible. Once Saroo grows up, though, it becomes a little tedious – there isn’t actually much drama to Saroo’s story, so the movie tries to create it by having Saroo obsess and mope over and over again. I’d still recommend it based just on the first half, though. When psychopathic criminal Simon Phoenix (Wesley Snipes) gets resurrected from cryostasis in a future that has embraced peace and doesn’t have the skills to deal with his crimes, the San Angeles PD has no choice but to also resurrect his old nemesis, cop John Spartan (Sylvester Stallone) to catch him. This is a ridiculous science fiction action movie that makes no sense, but it’s a lot of fun – it’s got a wacky fascist-masquerading-as-benign future world, lots of explosions, both Wesley Snipes and Sylvester Stallone having a blast hamming it up, an amazingly earnest Sandra Bullock, a delightfully evil corporate overload – what more do you need? Lethal Weapon 2 is a prime example of why sequels have a such a bad reputation. It gets rid of everything unique about the first movie and turns the characters into dumb comedic action stereotypes. I mean it’s not bad on its own – Joe Pesci is an especially great addition to the cast as the squirrely but excitable protected witness Leo Getz – but when compared to the first movie, it’s a definite step down. But if you’re just looking for campy and fun action, you can’t go wrong. I did read that the writer of the first movie, Shane Black, wrote a treatment for this movie that continued Riggs’ story arc and was pretty dark, but the studio didn’t want such a serious movie. I would’ve loved to see that version, though.